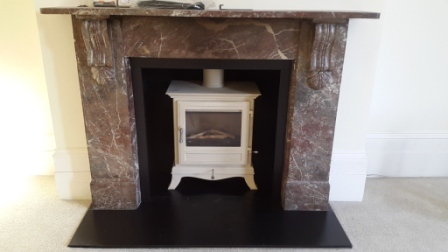 This successful installation of Chesney’s Beaumont 8kw stove was carried out in a Drawing Room in a property in Tunbridge Wells, Kent. The Beaumont 8KW multi fuel stove is DEFRA exempt for use in smoke control areas which means it can be safely and legally used to burn logs in all major cities and towns throughout the UK. Net efficiency rating 78.7%. Available in black, parchment, sage green, atlantic blue, autumn leaf and silver finish. Also available as a 4KW wood burning stove and 6KW multi fuel stove.